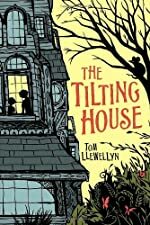 Review: An exciting, thrilling, and wonderful story of mysteries, The Tilting House, written by Tom Llewellyn, is a story of great family values and friendship that always trail from one very abnormal home. How can a home possibly be an abnormal one? Something is not right with this house and two brothers and a girl from down the street are about to unravel its secrets, secrets that have been kept in the tilting house that can change a person’s life forever. When Josh and Aaron Peshik move into a new home and out of their cramped apartment, Josh is not very happy. Although the house is bigger and came for an extremely low price, it had its problems. For one thing, the floors of the house tilted three degrees, making it hard to maneuver around the place. But the longer Josh and his family stay in the house, the more attached they become to it. The house’s previous owner placed many secrets into the house, such as grow powder, invisibility, and much, much more, but when his family is accused of theft, and Josh’s father loses his job, Josh has to use the things left behind by the owner of the tilting house to clear his family name, and to find out the secrets of long ago; secrets of how the tilting house became a reality. The Tilting House is a superb story that, children will adore for a long time to come. I think the story is geared to readers around the ages of anywhere between eight years of age to thirteen because of its fantastic imagination such as invisibility. For a score of five stars, I give this book all five for the same reason and because this book really appeals to young as well as some older readers. I also like the idea of having many stories about the house chain together to form the main story because it really makes the reader excited and anxious to find out what is going to happen next. The ending to the story is brilliant and answered all of my questions that I asked myself during the book. In a book with a slanting house, The Tilting House is a slant in the right direction. I hope it entertains children, as it did me, for many more years to come. Review written by Brandon (7th grade student). We would like to thank Tricycle Press for providing a copy of The Tilting House for this review. Have you read The Tilting House? How would you rate it?